Park City Mayor Jack Thomas presented concept renderings and preliminary details of the proposed art district. 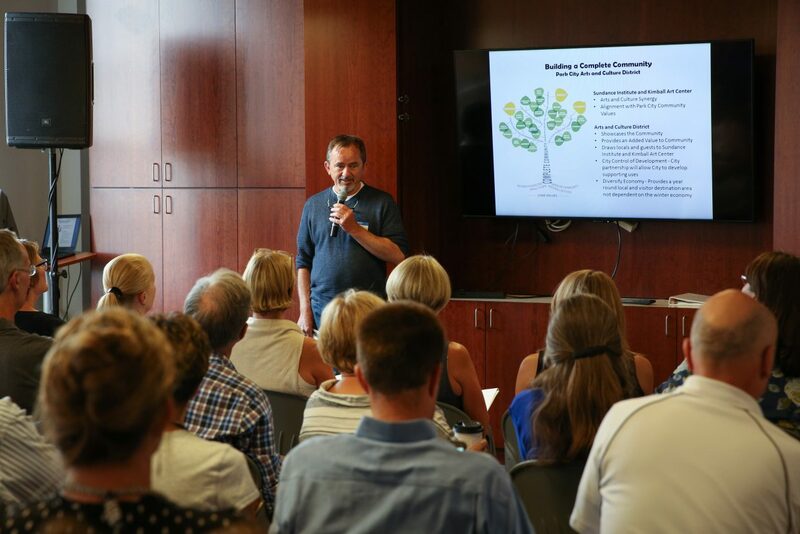 On Tuesday, Mayor Jack Thomas and Capital, Debts and Grants Budget Manager Nate Rockwood presented an overview of Park City’s plans to develop part of the Bonanza Park area into an arts and culture district. The reaction in the room was mostly upbeat and positive regarding the city’s plan to buy 5.25 acres. “I have been a Park City resident, but when I returned, I could no longer afford to live in Park City,” Kris Tart said. Owner of small business Wasatch Creamery, Tart said the idea of having an affordable space in the Bonanza Park area prompted her to attend the event, despite living in Midway. Tart bought a single-family home in Old Town in 2001 and sold it in 2006 with plans to leave the area and attend culinary school. When she returned three years later, housing prices were out of her family’s range. One of the goals of the district is to bring in small businesses to the area. “I’d love to find out how to become a part of this,” she said. Artist Tom Horton has lived in the Prospector area as a full-time resident for the last three years. An artist, homeowner and neighborhood member, he is excited about the proposed district. “I like the idea very much,” he said. “Especially the way it gives the Bonanza neighborhood an identity, and a purpose, and really defines its role in Park City. “It’s going to be a complete village. It’s all there and there’s so much you can walk to,” Horton added. He hopes the redevelopment has a ripple effect in his neighborhood. “Maybe some of this energy and enthusiasm will percolate over into Prospector,” he said. Diego Zegarra, development and special projects manager at Park City Community Foundation, works closely with the Latino community in the area and hopes the changes in the area won’t erase resources for that community. At the heart of his concern is Anaya’s Market, a Hispanic grocer with a location close to developments such as Aspen Villas, Parkside Apartments and Holiday Village that is crucial to those communities. “I would love to see Anaya’s stay in that area. It’s very central to that population … and they use it often,” he said. The Park City Council will consider approval of a purchase agreement for the parcel in its July 13 and 20 meetings. Part of the process includes voting on whether to impose a 1 percent transient room tax to pay for the $19.5 million purchase price. More information on the Park City website.